Here is that EPFL says about restoring spinal cord injuries: Rats with spinal cord injuries and severe paralysis are now walking (and running) thanks to researchers at EPFL. Published in the June 1, 2012 issue of Science, the results show that a severed section of the spinal cord can make a comeback when its own innate intelligence and regenerative capacity—what lead author Grégoire Courtine of EPFL calls the "spinal brain"—is awakened. The study, begun five years ago at the University of Zurich, points to a profound change in our understanding of the central nervous system. It is yet unclear if similar rehabilitation techniques could work for humans, but the observed nerve growth hints at new methods for treating paralysis. #WIRELESS #ENERGY: "Recharging Just Got Automatic"
Here is what EETimes says about wireless recharging:Wireless inductive battery rechargers already cut the cable to many devices such as electric toothbrushes, but because there were no standards in place until recently, they still require a proprietary recharge station. Now that the Wireless Power Consortium has over 100 members for its Qi standard, analysts predict the time is ripe for a global wireless charging market, which is expected to exceed 100 million units annually by 2015, according to IMS Research (Austin, Texas). Motorola's Enterprise Tablet (ET1) used by businesses like HomeDepot for sales personnel can now run the same HTML5 apps as front-office users on their iPad, Blackberry Playbook or Windows 8 tablet. 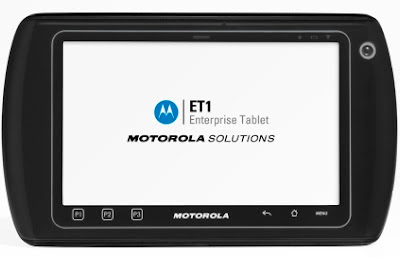 Here is what EETimes says about HTML5 apps: Those ruggedized Motorola Solutions' ET-1 tablets you see point-of-sale clerks at Home Depot and elsewhere wielding to display product features, scan barcodes and take credit cards are also being used in the warehouse to manage inventory and by buyers to visualize their entire supply chain. 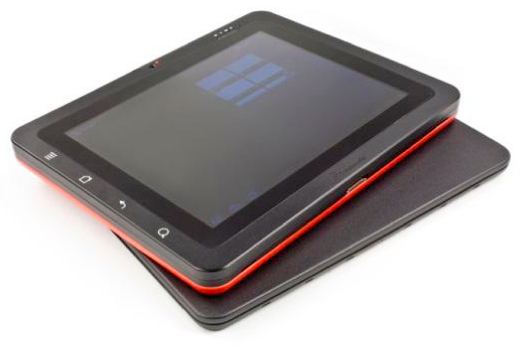 In the front office, however, ruggedized tablets are unnecessary, prompting Motorola Solutions to craft RhoMobile Suite, a software development environment for Windows PCs or MacOS computers that churns out universal HTML5-based apps that run not only one Motorolas ruggedized ET-1, but also on smartphones and tablets. #NANOTECH: "Tiny Giraffe Sculpture Wins Science as Art Contest"
Here is what University of California at Riverside says about its nano-giraffe: Shaahin Amini was ready to quit. The Ph.D. student at the University of California, Riverside’s Bourns College of Engineering had spent three hours looking into a microscope scanning a maze of black-and-white crosshatched lines, tubes and beads made of nickel, aluminum and carbon magnified 3,800 times. Then he saw it. It looked like some kind of animal. He zoomed in further. It now looked like the road runner from the Bugs Bunny cartoons. He rotated it. Bingo! A sheep? No, a giraffe. A 0.05 millimeter giraffe. He spent a few hours using Photoshop to add brown for the skin patches, red for the tongue and green in the background to resemble a jungle. It was done. He submitted the piece to the Science as Art competition at 2012 MRS (Materials Research Society) Spring Meeting in San Francisco. Amini’s piece, which was one of about 150 entries, was selected by the chairs of the meeting as one of the 50 finalists from throughout the world to be displayed in the exhibition hall. Meeting attendees voted on the winners and selected Amini’s piece as one of the first-place winners. Amini is a fourth-year Ph.D. student working with Reza Abbaschian, dean of the Bourns College of Engineering and William R. Johnson, Jr. Family Professor of Engineering. Amini’s research area is the nucleation and growth kinetics of graphene layers from molten metals. Graphene is a single-atom thick carbon crystal with unique properties, including superior electrical and heat conductivities, mechanical strength and unique optical absorption, which could have widespread use in electronics. Amini, for the first time, developed a novel processing technique to grow single layer graphene from a molten phase. The feature that Amini turned into a giraffe was created during the melting process of nickel, aluminum and carbon mixture. As the molten alloy solidified, the nickel and aluminum formed the body of the giraffe while the carbon was rejected and crystallized as a graphite cover. After further cooling, the graphitic cover wrinkled, due to less contraction than the metallic substrate, created a network of creases resembling the familiar skin patches of a giraffe. #WIRELESS: "Graphene Tooth Tattoo Detects Bacteria"
Here is what Princeton says about its tooth tattoo: Using silk strands pulled from cocoons and gold wires thinner than a spider's web, researchers at Princeton University have created a removable tattoo that adheres to dental enamel and could eventually monitor a patient's health with unprecedented sensitivity. In a laboratory in Princeton's Engineering Quadrangle, a graduate student demonstrated the system's wireless capability, breathing across a sensor attached to a cow's tooth. 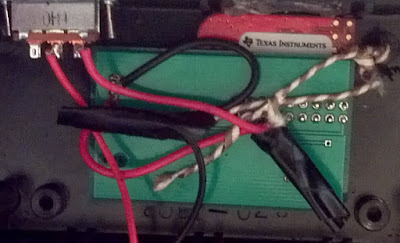 Instantaneously, the sensor generated a response to the student's breath and transmitted a signal to a nearby monitor. The researchers created the tattoo by bundling the silk and gold with graphene — an extremely thin sheet of carbon in which atoms are arranged in a honeycomb lattice. The material's unique properties allowed the researchers to construct a small, flexible device able to detect bacteria at a much higher sensitivity level than traditional methods. In tests, the researchers detected samples of bacteria that can cause surgical infections and others that can lead to stomach ulcers. The results were reported March 27 in the journal Nature Communications. In addition to professor Michael McAlpine, the paper's authors included graduate student Manu Mannoor, undergraduate Jefferson Clayton, Assistant Professor of Electrical Engineering Naveen Verma and associate research scholar Amartya Sengupta at Princeton; Hu Tao, David Kaplan and Fiorenzo Omenetto of Tufts University; and Rajesh Naik, of the Air Force Research Laboratory. Support for the research was provided by the American Asthma Foundation and the Air Force Office of Scientific Research. 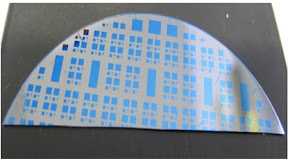 Next, the researchers made an antenna by depositing a pattern of thin gold strands onto the silk film, and connected it to the graphene sensors. When completed, the device resembles a common removable tattoo. To attach the sensor, the researchers place it against a tooth, or a person's skin, and wash it with water. The silk base dissolves in the water, but the graphene sensor and the antenna remain securely fastened to the spot. To allow the device to detect certain types of bacteria, the researchers attached peptides — fragments of proteins — to the graphene sensors. The peptides bind to bacterial cells and allow the researchers to detect a signal change from the graphene sensors. Designing the antenna was one of the project's challenges. The gold coil needs to be big enough to transmit a readable signal, but small enough to fit within the sensor's compact footprint. The team was able to attach the current version of the system to a cow's tooth; reducing the size of the sensor in order to fit onto a human's tooth would require further work. The current design allows for detection at a relatively short but practical distance, roughly a centimeter. Verma said if longer range was needed for other applications, modifications could be developed for the system. The researchers said one of the key developments of the research was the use of graphene with a biocompatible base, in this case silk. Current biosensors tend to be relatively rigid and heavy, and they are often uncomfortable for patients. In large part, that is a result of sensors' base material, called a substrate. In addition to its flexibility and biocompatibility, the solubility of silk meant that it could wash away with water or be dissolved by the body's enzymes. 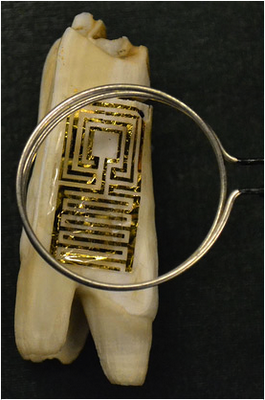 The team plans to conduct further studies to better understand the adhesion between the tooth enamel and the graphene sensor with the goal of achieving a longer-lasting bond and enhancing the longevity of the system. One of the challenges for a dental system is protecting the sensor from inadvertent damage from things like brushing. #MATERIALS: "Schrödinger's Hat Aims to Amplify Matter"
Here is what the University of Washington says about matter waves: Invisibility, once the subject of magic or legend, is slowly becoming reality. Over the past five years mathematicians and other scientists have been working on devices that enable invisibility cloaks – perhaps not yet concealing Harry Potter, but at least shielding small objects from detection by microwaves or sound waves. The authors dubbed their system "Schrödinger's hat," referring to the famed Schrödinger's cat in quantum mechanics. The name is also a nod to the ability to create something from what appears to be nothing. Gunther Uhlmann, who is on leave at the University of California, Irvine, has been working on invisibility with fellow mathematicians Allan Greenleaf at the University of Rochester, Yaroslav Kurylev at University College London in the U.K., and Matti Lassas at the University of Helsinki in Finland, all of whom are co-authors on the new paper. Here is what Kaspersky says about Flame: Kaspersky Lab announces the discovery of a highly sophisticated malicious program that is actively being used as a cyber weapon attacking entities in several countries. The complexity and functionality of the newly discovered malicious program exceed those of all other cyber menaces known to date. Although the features of Flame differ compared with those of previous notable cyber weapons such as Duqu and Stuxnet, the geography of attacks, use of specific software vulnerabilities, and the fact that only selected computers are being targeted all indicate that Flame belongs to the same category of super-cyberweapons. The primary purpose of Flame appears to be cyber espionage, by stealing information from infected machines. Such information is then sent to a network of command-and-control servers located in many different parts of the world. The diverse nature of the stolen information, which can include documents, screenshots, audio recordings and interception of network traffic, makes it one of the most advanced and complete attack-toolkits ever discovered. The exact infection vector has still to be revealed, but it is already clear that Flame has the ability to replicate over a local network using several methods, including the same printer vulnerability and USB infection method exploited by Stuxnet. Kaspersky Lab’s experts are currently conducting deeper analysis of Flame. Over the coming days a series of blog posts will reveal more details of the new threat as they become known. For now what is known is that it consists of multiple modules and is made up of several megabytes of executable code in total - making it around 20 times larger than Stuxnet, meaning that analysing this cyber weapon requires a large team of top-tier security experts and reverse engineers with vast experience in the cyber defence field. ITU will use the ITU-IMPACT network, consisting of 142 countries and several industry players, including Kaspersky Lab, to alert governments and the technical community about this cyber threat, and to expedite the technical analysis. 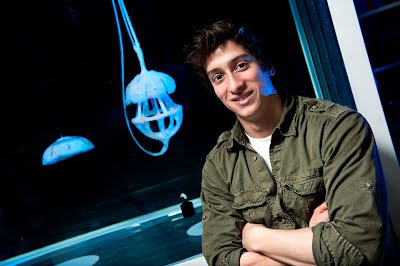 #WIRELESS: "15 Surprising (or not) Facts About Texting"
#ROBOTICS: "Robotic Jellyfish to Patrol, Cleanse Ocean"
Alex Villanueva and the experimental robotic jellyfish that one day could could patrol the seas for the military and for environmental safeguard. Here is what Virginia Tech says about their robot jellyfish: Virginia Tech College of Engineering researchers are working on a multi-university, nationwide project for the U.S. Navy that one day will put life-like autonomous robot jellyfish in waters around the world. The main focus of the program is to understand the fundamentals of propulsion mechanisms utilized by nature. Future uses of the robot jellyfish could include conducting military surveillance, cleaning oil spills, and monitoring the environment. The smaller models are being developed to be powered by hydrogen, naturally abundant in water, which is a huge step in autonomous craft. The larger models may be operated by electric batteries built into the robotic creature. In both cases, the jellyfish must be able to operate on their own for months or longer at a time as engineers likely won’t be able to capture and repair the robots, or replace power sources. #MEMS: "Air-Bag Substitutes for Dorky Bike Helmet"
Here is what ST Microelectronics says about invisible bike helmets: Motion sensors and microcontrollers from STMicroelectronics, a global semiconductor leader serving customers across the spectrum of electronics applications, form the brain and senses of the airbag bicycle helmet invented by Hövding, a Swedish design house. The combination of innovative design and state-of-the-art electronics has produced market-unique safety equipment for cyclists in a novel form factor. #MEMS: "Smart Tennis Rackets Leverage Embedded Sensors"
Here is what Movea says about its selection as the MEMS technology for Babolat's smart tennis racket: Movea (www.movea.com), the leader in motion processing and data fusion technologies, has been selected as technology partner by Babolat, the leading tennis equipment manufacturer, in a groundbreaking effort to develop the racquet of the future. The “Babolat Play & Connect” racquet will be the first-ever MEMS (Micro Electro-Mechanical Systems) technology enabled racquet with the built-in ability to gather and analyse game data and provide information that could only be manually estimated until now. The “Babolat Play & Connect” racquet will leverage Movea’s integrated SmartMotion® data fusion technology to measure specific elements of a player’s technique, enabling new opportunities for performance analysis, improvement and social results sharing. Babolat unveiled and demonstrated the first “Babolat Play & Connect” racquet prototype today at the Roland-Garros French Open in Paris and is expected to launch the exciting new product in 2013. 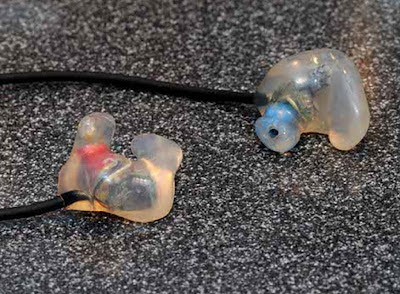 IndyCar drivers use these ear-buds to measure head trauma during crashes, each of which has three single axis accelerometers inside. 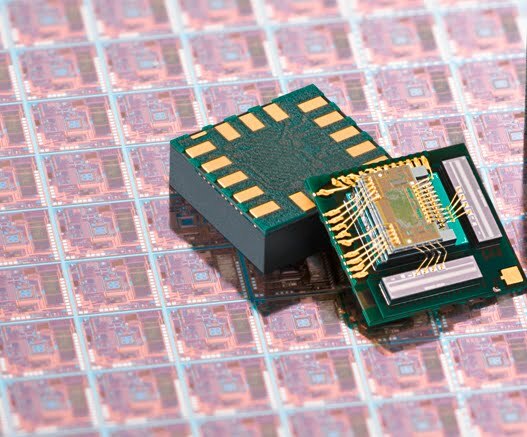 By switching to ADI's new single-chip high-G accelerometer, the next-generation will be three-times smaller, looking more like ordinary ear-plugs. IndyCar's will still have a cord, because the also have a speaker for the radio to the pits, but for NFL and other athletes, instead of a cord, they will just have a red light which illuminates whenever the athlete has received a head shock strong enough to cause a concussion. Here is what EETimes says about preventing concussions with MEMS: Sports-related concussions have skyrocketed in the U.S. with over 3.8 million reported each year. New MEMS sensors small enough to be mounted inside an athlete's helmet, for example, could perform early detection of symptoms, giving doctors time to administer preventative therapies. Using high-G sensors for early detection of concussions could drastically reduce injuries, according to the American Association of Neurological Surgeons, since most injuries occur because treatment is delayed. More than 75 percent of concussions go undiagnosed, eventually contributing to over 30 percent of head trauma deaths in the U.S., according to the Centers for Disease Control and Prevention. Early detection also could cut medical bills and lost productivity, which is estimated to exceed $76 billion annually. 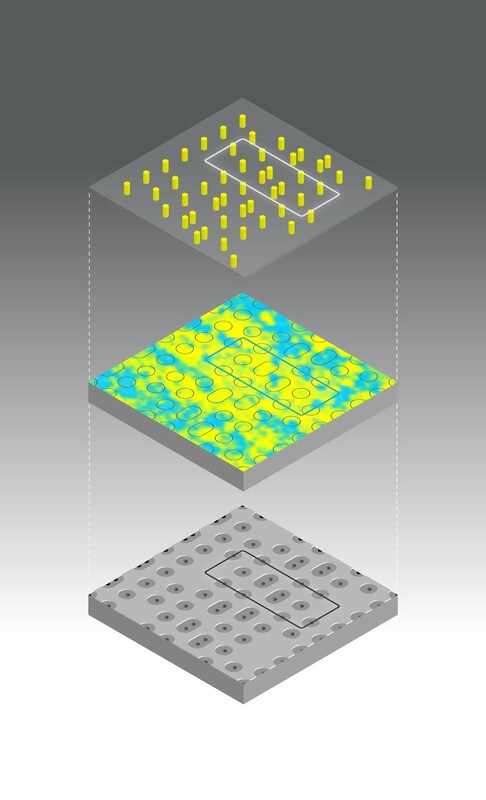 Bosch 3D chip stack wire bonds its MEMS die with an ASIC holding electronics into a single package. Here is what EETimes says about IMUs: Inertial measurement units (IMUs) integrate a three-axis accelerometer and a three-axis gyroscope, which Bosch Sensortec now claims to have put into the smallest package yet available for consumer-grade applications such as mobile phones, tablets and digital cameras. Every smartphone today has a three-axis accelerometer to track motion—for automatically switching its screen from portrait to landscape—but for advanced gaming, gesture recognition and indoor navigational tasks, a three-axis gyroscope is needed, too. Accelerometers only track linear motion, but gyroscopes track rotation-in-place motion, thus providing a higher precision when tracking fine user movements. Packing both accelerometers and gyroscopes into a 3.5-by-4.5 millimeter package could enable any smartphone can upgrade to a full six-degree-of-freedom inertial measurement unit (IMU). #MEMS: "Sensors In Drivers Ears Makes Sunday's Indy 500 to be Safest Yet"
This weekend’s Indy 500 (May 27) could be one of the safest in U.S. auto racing history by combining 200-mph race cars with emerging MEMS technologies. 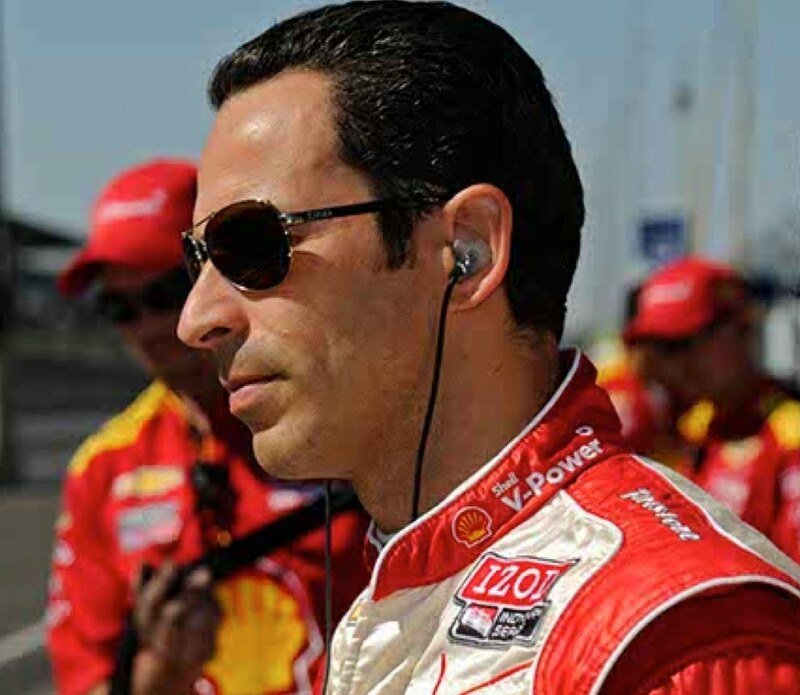 Along with new safety features created by IndyCar engineers, MEMS sensors like the three high-G accelerometers inside each driver’s earpiece will be used to detect concussions. The same high-G sensors may eventually be used by NASA to protect astronauts from hard splashdowns. IndyCars are now equipped to stream data from three high-G accelerometers into black-box accident recorders looping through a 90-second memory. In an accident, the system shuts down on impact. After a crash, accelerometer data from 30 seconds before and 60 seconds after impact are correlated with head injuries. Accident data can then be used to improve IndyCar cockpit safety. #CHIPS: "Every 15 Seconds Another Counterfeit Threatens"
Here is what IHS iSuppli says about counterfeit parts: More than 12 million parts have been involved in counterfeit incidents during the period spanning the start of 2007 through April 2012, according to Rory King, director, supply chain product marketing at IHS, citing data from ERAI. King delivered the news here on Friday to an audience of electronics industry participants attending the ERAI Executive Conference, co-hosted by IHS. In his presentation, King noted that reported incidents of counterfeited parts amounted to 1,363 in 2011. However, each incident can include thousands of separate parts, adding up to 12 million over the past five-and-one-quarter years. 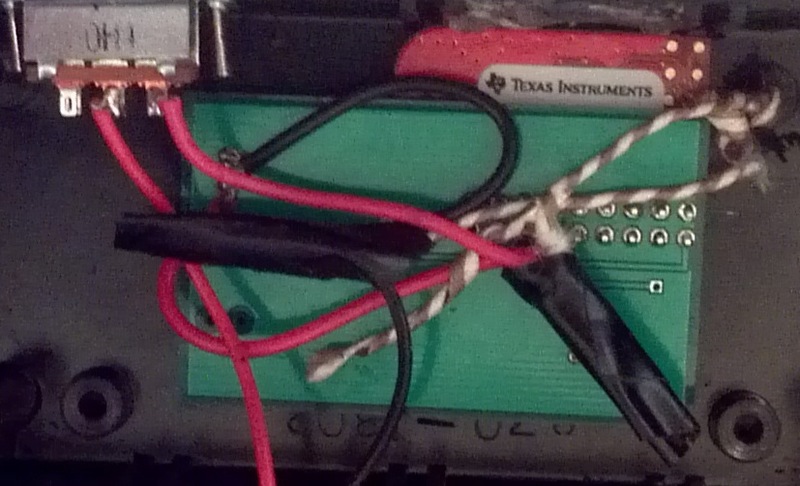 This equates to slightly more than 1 counterfeit part every 15 seconds. While the U.S. and China dominate in terms of reports at a combined 65 percent, the countries of origin accounting for the counterfeit parts is more disparate, with the four nations of Malaysia, South Korea, Japan and the Philippines collectively accounting for 64 percent of reports, according to ERAI data. However, the accuracy and value of this data is limited, King noted, given that counterfeiters are highly skilled at disguising the true origin of their wares. King’s presentation also highlighted the international impact of new U.S. Department of Defense (DoD) regulations on foreign suppliers to the U.S. government. The U.S. National Defense Authorization Act (NDAA), which was signed into law on Dec. 31, imposes strict regulations and severe criminal penalties on counterfeits supplied for government military and aerospace programs. #MARKETS: "IBM CEO Survey Endorses Personalizing Communications"
Here is what IBM's C-Suite study says in its executive summary (click :"Further Reading" to download the entire study: For some time now, businesses have been refining and optimizing their networks of suppliers and partners. They’re streamlining supply chains, creating massive back-office efficiencies and perfecting everything from just-in-time inventory to predictive merchandising. But something just as meaningful has been happening in the marketplace — the sudden convergence of the digital, social and mobile spheres — connecting customers, employees and partners in new ways to organizations and to each other. These changes put pressure on the front office to digitize and adapt but also create opportunities for the organization to innovate and lead. 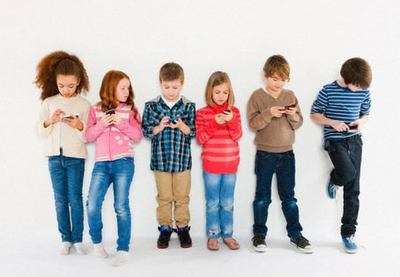 Leaders are recognizing that our new connected era is fundamentally changing how people engage. This shift is one reason why, for the first time since this CEO Study series began in 2004, technology now tops the list of external forces impacting organizations. Above any other external factor — even the economy — CEOs expect technology to drive the most change in their organizations over the next three to five years. The emphasis on openness and collaboration is even higher among outperforming organizations — and they have the change-management capabilities to make it happen.2 As CEOs open up their organizations, they are not inviting chaos. The need for control remains, but it is evolving into a new form — one better suited to the complexity and pace of business today. To engage customers as individuals, CEOs are building analytical muscle to respond with relevance and immediacy. As a group, CEOs are investing in customer insights more than any other functional area — far above operations, competitive intelligence, financial analysis and even risk management. More than 70 percent of CEOs are seeking a better understanding of individual customer needs and improved responsiveness. Given the need for deep customer insight, outperformers have a distinct advantage. They are far more adept at converting data into insights, and insights into action. Although face-to-face will remain the most prevalent form of customer interaction, CEOs expect a step-change in the use of social media. Over half expect social channels to be a primary way of engaging customers within five years. 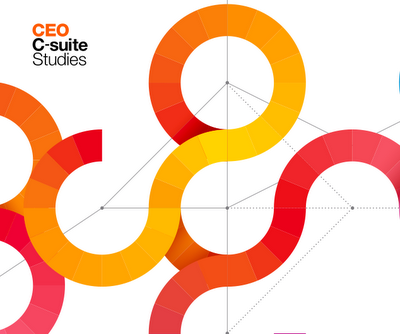 Extensive partnering is providing the edge CEOs need to take on radical innovation. The pressure to innovate is not subsiding, and organizations are teaming to meet the challenge. More than half of all CEOs are partnering extensively to drive innovation. Compared to their less successful peers, outperformers are partnering for innovation more aggressively. But they are also tackling more challenging and disruptive types of innovation. Instead of settling for simply creating new products or implementing more efficient operations, they’re more likely to be moving into other industries or even inventing entirely new ones...To steer their organizations effectively, CEOs told us three leadership traits are most critical: inspirational leadership, customer obsession and leadership teaming across the C-suite. Interestingly, these characteristics closely align with the goals of empowering employees through values, engaging customers as individuals and amplifying innovation with partnerships. This linkage illustrates what CEOs intuitively know: their evolution as leaders directly impacts their organizations’ behavior, culture and, ultimately, results. #MEMS: "HD Ear Buds for Music and Phone to Allow Conversations Too"
Here is STMicroelectronics says about its MEMS microphone in the Soundchip: STMicroelectronics (NYSE: STM), a global semiconductor leader serving customers across the spectrum of electronics applications and a leading supplier of high-performance audio ICs, together with Soundchip SA, a Swiss-based innovator in audio-systems technology and originator of the High Definition Personal-Audio™ (HD-PA®) Reference, today introduced technologies and components for the smart audio accessory – an exciting new concept in personal listening. 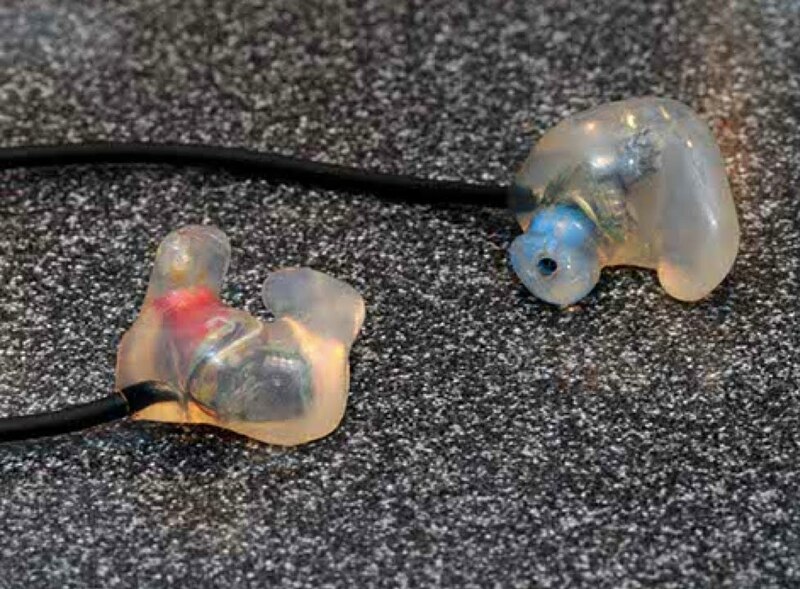 Worn like a pair of In-Ear Monitors (IEMs), the smart audio accessory features new means of controlling and personalizing the sound experience. Designed to be worn at all times, the smart audio accessory supports all use modes, including music, telephony and direct conversation, without requiring any reconfiguration of the apparatus in the ear. Furthermore, the smart audio accessory maintains a faithful reproduction of sound while providing a robust shield against unwanted background noise. The smart audio accessory employs Soundchip’s patented sound-processing technologies to provide a natural and comfortable sound experience when speaking, even with the accessory in place and physically sealing the ear. 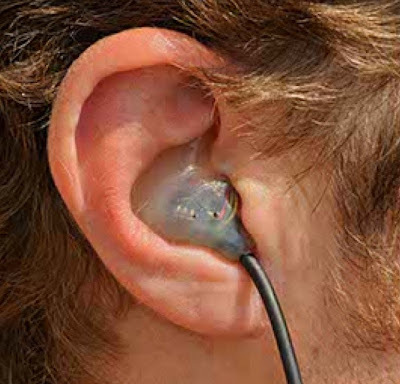 By electro-acoustically “opening” this seal, the smart audio accessory is able to pass ambient sound directly to the wearer, providing an ability to listen and converse naturally with the accessory still in place. The smart audio accessory provides the ability to conveniently switch between different audio sources - voice, music or ambient sound – by simply pressing a button, making a pre-defined gesture or issuing a voice command. Various options are supported, including those that leverage ST’s recognized leadership in MEMS motion sensors. In addition, by connecting the smart audio accessory to a DSP or DSP-capable controller (such as the STM32 F4), and a smartphone or tablet computer, the sound experience can be further enhanced by taking advantage of custom-made apps, which individually process and mix sound sources to deliver innovative new features, such as augmented reality. Comprising Soundchip’s patented HD-PA® Ready Electronic and Acoustic platforms combined with STMicroelectronics’ best-in-class HD-PA® Ready MEMS microphones, the smart audio accessory represents an exciting fusion of electronics, MEMS sensing technology and acoustics and provides a compelling example of the future of personal audio. Soundchip and ST will be presenting examples of the smart audio accessory concept to customers throughout June. Here is what Intel says about the 18 year old discovery of quantum teleportation: Quantum teleportation--fact or fiction? 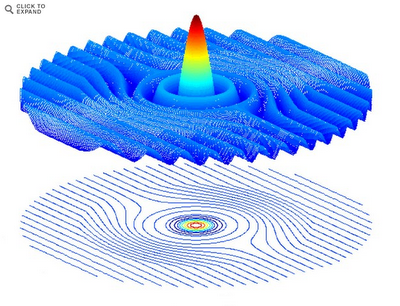 Thanks to one young scientist, quantum teleportation may soon become a reality. At Intel's International Science and Engineering Fair, young innovators from around the world presented their groundbreaking research. Ari Dyckovsky, 18, of Leesburg, Vir. won $50,000 for his project to realize quantum teleportation. Working with the National Institute of Standards and Technology in Gaithersburg, MD, Dyckovsky claims to have found that once atoms are linked through a process called “entanglement,” information from one atom will just appear in another atom when the quantum state of the first atom is destroyed. It is a literal quantum leap: the information doesn’t travel to the second atom – it would just be there. Using this method, the National Security Agency, or other organizations requiring high levels of data security, could send an encrypted message without running the risk of interception; a message would simply appear in another location. 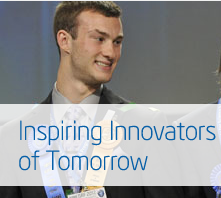 The Intel International Science and Engineering Fair is the world’s largest high school science competition and a program of the Society for Science & the Public. The competition brought more than 1,500 young scientists from more than 70 countries, territories and regions to Pittsburgh last week to compete for more than $3 million in awards. #WIRELESS: "Enterprizes Open Private Label App Stores"
Here is what Partnerpedia says about its new private-label app store solution: Partnerpedia, a leading provider of enterprise application store and marketplace solutions, today announced the general availability of its Enterprise AppZone solution for corporate IT. Enterprise AppZone is a cloud-based service that offers a curated app marketplace consisting of topselling business apps, as well as a private enterprise app store for corporate IT to distribute and manage apps on BYOD and company owned devices. The Enterprise AppZone marketplace consists of top selling business apps for Android that are available for direct purchase and download. 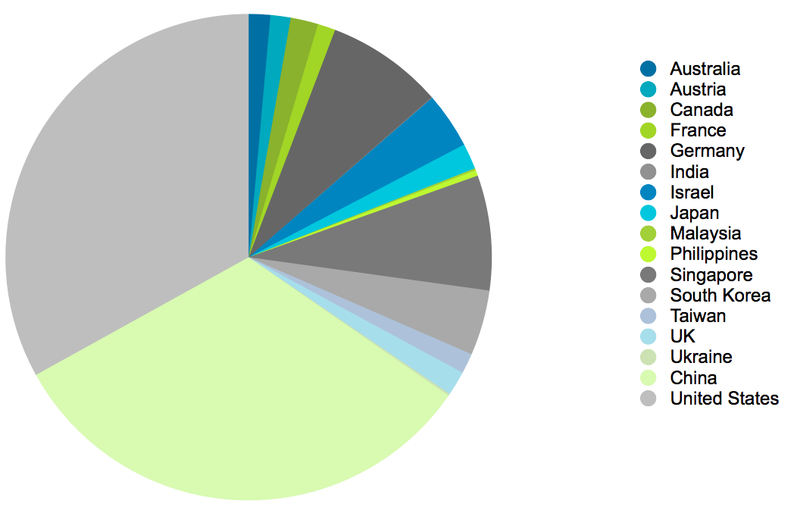 According to StrategyAnalytics, Android represented over 50% of the US smartphone market in 2011. The value of purchasing apps via Enterprise AppZone over conventional app stores is that corporate IT retains ownership and control over the app licenses for distribution and reallocation to end-users. In addition, the apps are vetted for viruses and the marketplace supports corporate procurement models such as volume and PO based purchasing. When it comes to iOS apps, all commercially available iOS apps must be purchased via iTunes/App Store due to Apple’s licensing restrictions. However, companies purchasing apps using Apple Volume Purchase Program (VPP) can manage and distribute VPP redemption codes (licenses) using Enterprise AppZone. For Mobile App Management (MAM), Enterprise AppZone allows corporate IT to create a private Enterprise App Store (EAS) that gives IT control over app policies and procedures while providing users a secure, self-service model for accessingcorporate apps directly on the device. Corporate IT is able to centrally control the publishing, distribution and management of iOS or Android apps across multiple device types. Apps published into the private company store are automatically scanned for viruses. User access to specific apps is controlled via individual and group permissions with support for LDAP and AD. Other policy controls include mandatory install, versioning and remote deactivation. End-users can then securely access the private company app store on their device, through an easy-to-use model that’s similar to consumer style app stores. Unlike traditional Mobile Device Management (MDM) solutions, Enterprise AppZone is well suited for BYOD through user self-service, and employs application policies that avoid privacy and liability concerns. Enterprise AppZone was designed with feedback from participants in its early access program, which include organizations from industries such as energy, technology, academia and consumer media. The program spanned two months and encompassed real world scenarios such as the distribution of apps to field operators, private distribution of apps to customers, and enforcement of app policies based on roles and permissions. Here is what UCL says about their silicon-based RRAM: The first purely silicon oxide-based ‘Resistive RAM’ memory chip that can operate in ambient conditions – opening up the possibility of new super-fast memory - has been developed by researchers at UCL. Our ReRAM memory chips need just a thousandth of the energy and are around a hundred times faster than standard Flash memory chips. The fact that the device can operate in ambient conditions and has a continuously variable resistance opens up a huge range of potential applications. The team have been backed by UCLB, UCL’s technology transfer company, and have recently filed a patent on their device. Discussions are ongoing with a number of leading semiconductor companies. The technology has promising applications beyond memory storage. The team are also exploring using the resistance properties of their material not just for use in memory but also as a computer processor. The work was funded by the Engineering and Physical Sciences Research Council. #ENERGY: "Piezoelectric Viruses Self-Assembly Energy Generators"
Here is what EETimes says about piezoelectric viruses: Scientists have discovered a way to genetically engineer a living virus to be piezoelectric, enabling self-assembling arrays of them to produce enough electricity to power small electronic devices. In their demonstration prototype, a button backed with a virus array generated enough electricity to illuminate an LCD display. Researchers at the U.S. Department of Energy's Lawrence Berkeley National Laboratories hope to extend their discovery by growing nanoscale arrays of piezoelectric viruses in sheets that generate enough energy to power mobile devices from normal body motions, such as walking, without the need for batteries. #CLOUD: "World's 1st Virtualized GPU Accelerates Cloud Computing"
Here is what NVIDIA says about virtualized GPUs: NVIDIA today unveiled the NVIDIA® VGX™ platform, which enables IT departments to deliver a virtualized desktop with the graphics and GPU computing performance of a PC or workstation to employees using any connected device. · NVIDIA VGX Boards. These are designed for hosting large numbers of users in an energy-efficient way. 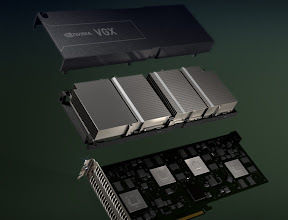 The first NVIDA VGX board is configured with four GPUs and 16 GB of memory, and fits into the industry-standard PCI Express interface in servers. · NVIDIA VGX GPU Hypervisor. This software layer integrates into commercial hypervisors, such as the Citrix XenServer, enabling virtualization of the GPU. 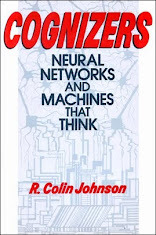 · NVIDIA User Selectable Machines (USMs). This manageability option allows enterprises to configure the graphics capabilities delivered to individual users in the network, based on their demands. Capabilities range from true PC experiences available with the NVIDIA standard USM to enhanced professional 3D design and engineering experiences with NVIDIA Quadro® or NVIDIA NVS™ GPUs. 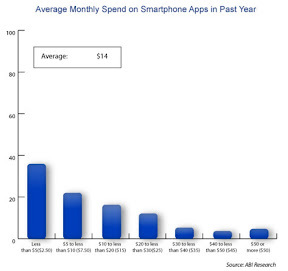 #WIRELESS: "Heavy App Users Skew Mobile Marketing"
Here is what ABI Research says about which users are buying the most apps: According to a US consumer survey conducted by ABI Research, about two-thirds of app users have spent money on an application on at least one occasion. Among these paying users, the mean spend was $14 per month. Behind the seemingly high average amount there are, however, some striking findings. ABI Research’s “Wave 3 US Survey Results – Mobile Applications” survey tracks these trends among US mobile consumers. #MATERIALS: "IMEC Hawks Memristors at VLSI Symposia"
Here is what EETimes says about memristors: The Interuniversity Microelectronics Centre (IMEC) will report next month on progress to make its memristor variation, called resistive-RAMs (RRAM), the dominate memory technology in four papers at the VLSI Symposia in Honolulu. At the Symposia June 12 to 15, IMEC (Leuven, Belgium), which claims RRAM will be ready for reliable mass production below 20 nanometers, will describe its cross-bar architecture. IMEC claims the architecture is denser, faster and lower-power than flash, but suitable to replace any memory type, including DRAMs. #ENERGY: "Living Virus Generates Electricity for Gadgets"
Here is what Lawrence Berkeley National Laboratories says about piezoelectric viruses: Imagine charging your phone as you walk, thanks to a paper-thin generator embedded in the sole of your shoe. This futuristic scenario is now a little closer to reality. Scientists from the U.S. Department of Energy’s Lawrence Berkeley National Laboratory (Berkeley Lab) have developed a way to generate power using harmless viruses that convert mechanical energy into electricity. Seung-Wuk Lee, a faculty scientist in Berkeley Lab’s Physical Biosciences Division and a UC Berkeley associate professor of bioengineering, conducted the research with a team that includes Ramamoorthy Ramesh, a scientist in Berkeley Lab’s Materials Sciences Division and a professor of materials sciences, engineering, and physics at UC Berkeley; and Byung Yang Lee of Berkeley Lab’s Physical Biosciences Division. #MEMS: "Sensor Aims to Prevent Elderly from Falling"
#CHIPS: "Novel Spiral Spins Enable Memory Architecture"
Up to now, computers have saved data in magnetic domains (“bits”) on the hard drive. These domains are already inconceivably small by human standards: a single 1 terabyte hard drive contains around eight billion bits. However, in order to make new functionalities possible, computer components will have to “shrink” even more in future. However, when the bits lie too close together, their magnetic fields overlap, making the writing and reading of data impossible. For this reason, new concepts are required. One method of transporting data on a nanometre scale was suggested recently by scientists at Forschungszentrum Jülich and the universities of Hamburg and Kiel. “Spin spirals” is what the researchers call the spiral arrangement of the magnetic properties (spins) in chains of iron atoms, which they placed in twin rows on an iridium surface for their experiments. This is the first time that researchers have observed such an order in an atomic chain atom for atom. How spin spirals will transport data in future can be explained using a highly simplified comparison: if you connect it at one end to a magnetized object, then its magnetic orientation can be read out at the other end, a few atoms and up to three hundred thousands of a millimetre (30 nanometres) further away. This would make it possible to compress data even further and then read them out via spin spirals. Physically, the spin spirals have a complex magnetic order – experts say they are “non-collinear” because the spins of neighbouring atoms are not parallel as is the case in simple magnetic materials. The complex order has advantages for certain applications. For example, from the outside they appear to possess only a small residual magnetization, which is why the entities are not sensitive to external magnetic fields. At the same time, however, they can be influenced to a small extent by magnetic objects at the ends, which is important for an efficient transport of information. The samples were fabricated and investigated in Hamburg. 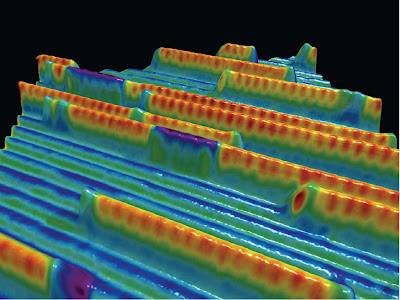 The researchers used a scanning tunnelling microscope with a magnetic tip to measure the magnetic structure of the sample surface. In Jülich, highly complex computer simulations were performed to analyse the measurement data and to understand why the spin spirals form in the first place. The researchers now plan to investigate whether the system is also stable at higher temperatures of up to room temperature. #CHIPS: "Learn Next-Gen Semiconductors at VLSI Symposium"
Here is what the Symposia is saying about their learning courses and moderated discussions: The 2012 Symposia on VLSI Technology and Circuits have announced further details of the Short Courses and first-ever Joint Focus Sessions to be held at this year’s edition of these annual meetings, which are the premier mid-year gatherings for the presentation of cutting-edge research in microelectronics technology and circuit development. The Symposia will be held at the Hilton Hawaiian Village hotel here from June 12-14 (Technology) and from June 13-15 (Circuits). The Symposia alternate between Hawaii and Japan annually. This year’s Symposia include 55 sessions with more than 200 presentations, as well as keynote speeches, evening panel discussions, a luncheon talk, and evening reception and banquet. The Symposia will be preceded by Short Courses and the Silicon Nanoelectronics Workshop. -- VLSI Technology Short Course (June 11) -- “14nm CMOS Technology & Design Co-Optimization and Emerging Memory Technologies” -- This course will comprise six lectures given by distinguished speakers, covering state-of-the-art technology and circuit design for 14nm-generation CMOS. It will start with a perspective on the history and future of FinFET technology by Prof. Tsu-Jae King Liu of UC-Berkeley where FinFETs were first developed, followed by discussion on design enablement for FinFET technology from a foundry perspective by Dr. Sheu of TSMC. Prof. Takagi from the University of Tokyo will cover the state-of-the-art in high-mobility channel devices and their integration onto silicon substrates. Technical challenges and potential process/design solutions for patterning and interconnects will be presented by Dr. Levinson from GLOBALFOUNDRIES and Dr. Angyal of IBM Corporation, respectively. Finally, Dr. Koh of Samsung will describe emerging memory technologies and contrast their prospects and requirements. 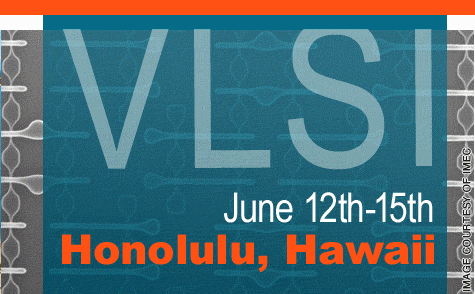 -- VLSI Circuits Short Courses (June 12) -- Two parallel full-day courses will be given by 12 distinguished international speakers from industry and academia. A single registration fee covers both, and participants can switch between the two. Afterward, a roundtable for both Circuits courses will be held to foster interaction and discussion with all speakers. - “Designing in Advanced CMOS Technologies” will focus on the challenges sub-32nm technology nodes pose to VLSI designers. It will start with two process-oriented presentations by Tsu-Jae King Liu of UC-Berkeley and Thomas Skotnicki of STMicroelectronics, discussing evolutionary and disruptive scaling solutions, covering bulk CMOS devices, FinFETs and SOI devices. Next, challenges and future concepts of SRAM scaling for large embedded-memory applications will be presented by Fatih Hamzaoglu of Intel. Then, mixed-signal and power-aware design challenges will be discussed by Fu-Lung Hsueh of TSMC and Youngsoo Shin of KAIST, respectively, taking into account layout effects as well as a transistor’s analog behavior. These will be followed by a discussion on advanced CAD flows addressing custom design challenges in new technology nodes, by David White of Cadence. - The second Circuits Short Course, “Ultra Low Power SoC Design for Future Mobile Systems,” will cover the technical requirements needed to successfully realize next-generation mobile systems. Speakers will cover digital circuit techniques for logic and memory, as well as system-level aspects. The course will start with a broad vision of the future of mobile systems by Jan Rabaey of UC-Berkeley, and then four talks by Masaya Sumita of Panasonic, Kyomin Sohn of Samsung, Gangadhar Burra of Texas Instruments and Jared Zerbe of Rambus will focus on the most important aspects of design optimization, including logic design, memory systems, RF/analog and architecture-optimization, as well as high-performance, low-power signaling, respectively. A complete case study on a multi-core cellular platform with a specific focus on system-level aspects by John Redmond of Broadcom will end the course. - SRAMs Design in Nano-Scale CMOS Technologies (Invited), K. Zhang, Intel Corp.
- A Highly Pitch Scalable 3D Vertical Gate (VG) NAND Flash Decoded by a Novel Self-Aligned Independently Controlled Double Gate (IDG) String Select Transistor (SSL), C.-P. Chen et al., Macronix International, Ltd.
- Practical Implications of Via-Middle Cu TSV-induced Stress in a 28nm CMOS Technology for Wide-IO Logic-Memory Interconnect (Invited), J. West et al.,Texas Instruments, Inc.
- A 0.13µm 8Mb Logic Based CuxSiyO Resistive Memory with Self-Adaptive Yield Enhancement and Operation Power Reduction, X.Y. 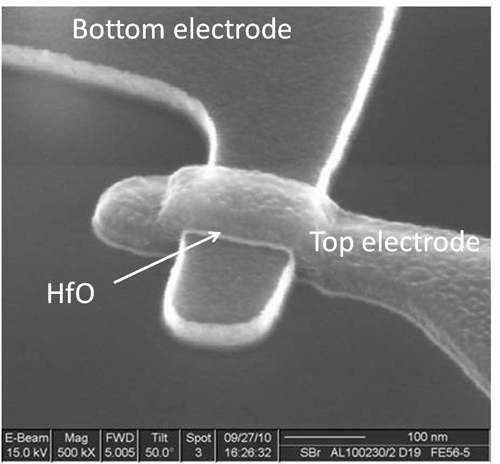 Xue et al., Fudan University and Semiconductor Manufacturing International Corp.
- A 3.14 um2 4T-2MTJ-Cell Fully Parallel TCAM Based on Nonvolatile Logic-in-Memory Architecture, S. Matsunaga et al., Tohoku University and NEC Corp.
- 1Mb 4T-2MTJ Nonvolatile STT-RAM for Embedded Memories Using 32b Fine-Grained Power Gating Technique with 1.0ns/200ps Wake-up/Power-off Times, T. Ohsawa et al., Tohoku University and NEC Corp.
- A Simple New Write Scheme for Low Latency Operation of Phase Change Memory, Y.-Y. Lin et al, Macronix International Co., Ltd. and IBM Corp.
- Analysis of Random Telegraph Noise and Low Frequency Noise Properties in 3-D Stacked NAND Flash Memory with Tube-Type Poly-Si Channel Structure, M.-K. Jeong et al., Seoul National University and Hynix Semiconductor Inc.
- A 0.41µA Standby Leakage 32Kb Embedded SRAM with Low-Voltage Resume-Standby Utilizing All Digital Current Comparator in 28nm HKMG CMOS, N. Maeda et al., Renesas Electronics Corp.
- Design Enablement at 14nm: The Challenge of Being Early, Accurate, and Complete (Invited), M.E. Mason, Texas Instruments Inc.
- Designing in Scaled Technologies: 32nm and Beyond (Invited), S. Kosonocky et al., AMD Inc.
- The Optimum Device Parameters for High RF and Analog/MS Performance in Planar MOSFET and FinFET (Invited) T. Ohguro et al., Toshiba Corp.
- Dynamic Intrinsic Chip ID Using 32nm High-K/Metal Gate SOI Embedded DRAM, D. Fainstein et al., IBM Corp.
- A Fully-Digital Phase-Locked Low Dropout Regulator in 32nm CMOS, A. Raychowdhury et al., Intel Corp.
- A 22nm Dynamically Adaptive Clock Distribution for Voltage Droop Tolerance, K. Bowman et al., Intel Corp.
- Voltage Droop Reduction Using Throttling Controlled by Timing Margin Feedback, M. Floyd et al., IBM Corp.
- An On-Die All-Digital Delay Measurement Circuit with 250fs Accuracy, M. Mansur et al., Intel Corp.
- Isolated Preset Architecture for a 32nm SOI embedded DRAM Macro, J. Barth et al., IBM Corp.
- 1Gsearch/sec Ternary Content Addressable Memory Compiler with Silicon-Aware Early-Predict Late-Correct Single-Ended Sensing, I. Arsovski et al., IBM Corp.